Kit Rae is one of the foremost fantasy and collectible weapon designers in the industry and a product developer for a variety of customers and licensees. Among others, Kit has supervised product development for The Lord of the Rings weapons, Blade, Indiana Jones, Rambo, Hellboy, The Mask of Zorro, Mortal Kombat, The Shadow, Dragonheart, Kull the Conqueror and Stargate. In addition to product development, Kit was the lead designer for United Cutlery for over fifteen years. Kit Rae is not only well known for his fantasy swords and blades, but has also been an avid throwing knife and axe enthusiast for many years. This Aircobra is constructed of one solid piece of AUS-6 stainless steel. 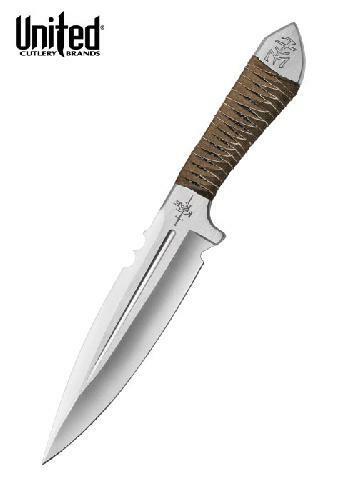 It features a balanced handle-to-blade design for perfect throwing and a leather-wrapped grip. Delivery includes a nylon belt sheath for carry or storage and a point-based paper throwing target.